Amrai Pari was launched in 2014 as a research study to identify how rural and urban communities live under extreme weather and climate change; and to examine their ability to work together to respond to natural crises. The idea behind the project is to enhance communities’ ability and motivation to work together to prepare for natural hazards. The project’s presence on Facebook caters to a young, urban audience; and addresses important concepts related to urban hazards like earthquake, fire and extreme heat. Its social media activity is built on the success of the Amrai Pari television series; and has reached over 22 million people in Bangladesh. Its Facebook-based approach has succeeded in initiating dialogues on innovative and extensive initiatives on natural disaster preparedness. The project has increased audience interaction in dealing and coping with natural disasters. In fact, its research has indicated that discussions have been a key driver for communities to take action to enhance their resilience. Research also shows that 47 per cent of people who were exposed to Amrai Pari, on any platform, responded by taking action to prepare for disasters. Amrai Pari’s Facebook page has more than 25 million impressions, 1.5 million page engagements and 4 million video views through its follower base of 104,000, almost all of which have ‘liked’ the page in the last 12 months. Amrai Pari has been recognised as a Winner for the year 2017 in the category Community Mobilisation for encouraging communities to work together on disaster preparedness. 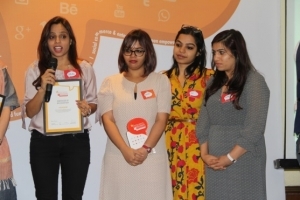 #BearNoMore is a campaign aimed at breaking the taboos surrounding Intimate Partner Violence (IPV) among young unmarried couples of all genders in India. The campaign raised awareness on IPV issues by engaging young people from rural and urban areas online, and stimulating discussions on the subject with the intention of contributing to a decline in cases of IPV in the long term. The project used a hybrid approach of a responsive site and an active presence on social media platforms, which allowed its users to access reliable information using their mobile phones or personal computers safely and anonymously. They could also chose whether they wished to simply read the content or extend their interaction to engage more directly — joining discussion boards, asking questions via emails or private Facebook messages, or posting comments. What made the campaign unique from other similar ones was that #BearNoMore specifically focused on unmarried couples under 25 as opposed to existing initiatives that focus on domestic violence among married couples. Love Matters India designed the campaign specifically to resonate with this target group; and successfully reached out to over two million users online. Most of these users agreed that the campaign had contributed to a raised level of awareness and knowledge and, especially, brought them new insights on topics related to intimate partner violence. Janwaar Castle creates spaces of interaction among communities that it works with, by engaging children through the sport of skateboarding. Janwaar Castle believes that the children are the real leaders of a village who can pave the way for future. The initiative runs various educational and recreational activities for children and the communities they work with. The aim of the initiative is to ‘break the status quo’, which it facilitates through the setting up of model schools, library spaces, sporting activities for a target group. A Castle also includes a hostel for children to stay and learn through educational-cumrecreational activities. Skateboarding, though, is one of its key activities. The initiative has been working on building three new skate parks in villages around Janwaar, Madhya Pradesh, that caters to both beginners and professionals. Janwaar Castle initiative believes that the energy from the skate park will fuel all other activities in a very positive way. The initiative aims to send at least one child from the area to the Tokyo Olympics in 2020. Janwaar Castle is a completely crowd-funded initiative. So far, more than 100 friends from all over the world have contributed to make Janwaar Castle happen and keep it running. 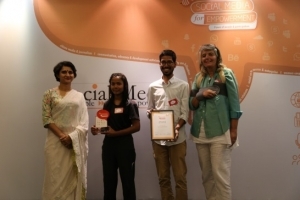 Janwaar Castle has been recognised as a Winner for the year 2017 in the category Community Mobilisation for promoting social change through skateboarding. Youngistaan Foundation is a Hyderabad-based voluntary outfit that organises and engages with socially aware individuals to spearhead social programmes for meaningful and empathetic interventions in the targeted areas of homelessness, poverty, education and gender awareness. Among the various programmes run by the organisations include the Bright Spark Programme, which is a holistic mentoring initiative that creates mindful and ‘caring’ learning spaces for underserved learners by integrating fundamental academic knowledge with higher-order thinking skills and vital life skills. The Hunger Heroes of the Feeding Programme reaches out to the homeless, with freshly cooked meals while the Transformers team provides basic hygiene, first-aid, and mental succour to the city’s abandoned. Women of Courage is a gender awareness programme that aims to build safe spaces of dialogue on teen health by engaging adolescent girls at government and low-income schools. 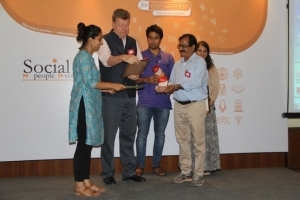 The Foundation is supported by about 3,000 registered volunteers who are involved in various programmes in Hyderabad and Secunderabad in Telangana, Noida in Uttar Pradesh, Bhopal in Madhya Pradesh and Mumbai in Maharashtra. 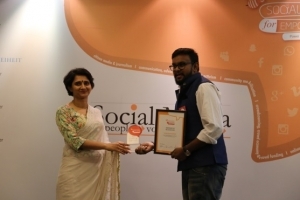 Youngistaan Foundation has received a Special Mention for the year 2017 in the category Community Mobilisation for engaging volunteers to work on various social issues. SchoolWiki was introduced by IT@School Project in 2009 as a comprehensive database of schools in the state of Kerala to foster a culture of collaborative learning among students. SchoolWiki, created using Wikimedia Foundation’s software, aims to facilitate collaborative content development and its sharing. The project collaborated with 15,000 schools in the state, targeting Classes I to XII. SchoolWiki is available in Malayalam and features a unique content collection created in collaboration with students, teachers, alumni and the public. The platform also lists details of all the schools in the state, besides putting on its portal over 30,997 articles and engaging 13,000 users. 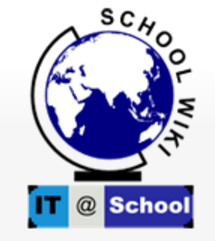 The users of SchoolWiki are able to key-in and update all their basic elementary details, historical references, infrastructure data, renowned alumni, website details, maps, blogs, clubs and forums, magazines, images and videos. IT@School Project has provided high-speed broadband Internet connectivity to all the schools in the state, enabling the schools to upload their details on SchoolWiki on a regular basis. The project has also established student groups in every school. These groups are called Student School IT Coordinator (SSITC), and help the School IT Coordinator (SITC) in ensuring regular updates of their content on SchoolWiki. SchoolWiki aims to be the largest and most comprehensive Malayalam educational database on the Internet. SchoolWiki by the Government of Kerala has received a Special Mention for the year 2017 in the category Community Mobilisation for fostering a culture of collaborative learning among students and schools. The Odisha Livestock Resources Development Society (OLRDS) was formed to boost rural economy and reduce rising trends of unemployment. It works broadly on the objectives of radically improving coverage of breed-able bovine population; door step delivery of artificial insemination services; and implementation of government schemes. The project has a Facebook page called Animal Husbandry Department of Odisha Government; its popularity demonstrates how social media can be used by the government for dissemination of information related to different initiatives and schemes, thereby bridging the information gaps between citizens and the government. The Facebook page has been successfully creating awareness and inspiring entrepreneurship in the livestock sector. The page has a reach of over 175,000 people, and has been viewed by about 70 lakh users so far. On an average, 2,300 people engage with the Animal Husbandry Department through its social media page on a daily basis. Meanwhile, to ensure that its page stays relevant and contextual, OLRDS ensures that information and content is constantly shared on Facebook to engage users in dialogues. 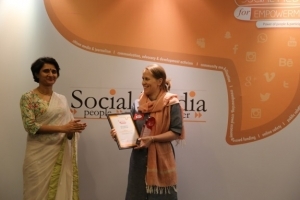 Odisha Livestock Resources Development Society (OLRDS) has been recognised for Chairman’s Recommendation for the year 2017 in the category Community Mobilisation for using social media for information dissemination.